These are awesome (Marimekko Memory Game tiles), although I think I would make them into a little mobile, instead. Did you all know about the vintage fabric group on Flickr? And if so, why have you been holding out on me? At least some of you are still sending me links, like Kristina and Cécile, who sent me to this Chinese ceramic dress art. And Kay sent me a link ages ago to this dress wallpaper (caution: some of the other wallpaper patterns on that site may not be Safe For Work). If I had a spare gazillion dollars (and about three inches more height and a lot more hair: these coats really call for long wavy hair and a modicum of willowiness) I might spend some of my loot on an elaborate brocade military coat at Samiah.com. And while I'm thinking about coats, did anyone but Jonquil notice the Pirate Queen jacket at EvaDress? It's not OFFICIALLY a Pirate Queen jacket, because you don't just go around advertising that you're a Pirate Queen. There should be a little stealth involved, at least until you come alongside and attempt to board. Sometime this week — tomorrow, I hope, since there's not a lot of week left — I'll announce this year's Dress A Day charity effort, and some other good news! Tell me where to get the gazillion dollars and a lot more hair. I’ll go for the coat even in my somewhat short condition! That BBC sale looks amazing! Have sent it to friends near and far, especially those near/in London.Also, that Samiah site? Swoon! LOVE that EvaDress pattern! Cropped jackets never look as cute on me as I’d like them to, but that’s tempting! OK, THAT’S a Hepburn movie that I’d like to see! Although I think I saw her in the prototype of this jacket in a movie and noticed the opening at the top of the sleeves looked a little weird when she moved around. Wow, that Pirate Queen jacket slays me. But I want to know how one gets in and out of it. Do I have to be sewn in by a cabin boy and then wait to be hacked out my mutineers? That jacket literally took my breath away. For one brief, crazy moment I thought I was tall and slim and did not have D cup obstructions.Does anybody carry antique patterns for clothes worn by Ma Kettle? That dress is PERfect! The sleeves in particular are so sweet. Now I have to go search for it! Help! Oh dear. I think I’m going to order that EvaDress pattern. And I’ve been so good about not buying patterns…but that one? Oh my goodness. That Marimekko Memory Game is really cool! This appeals so much more to me than matching duckies and bears. FYI You have inspired me. 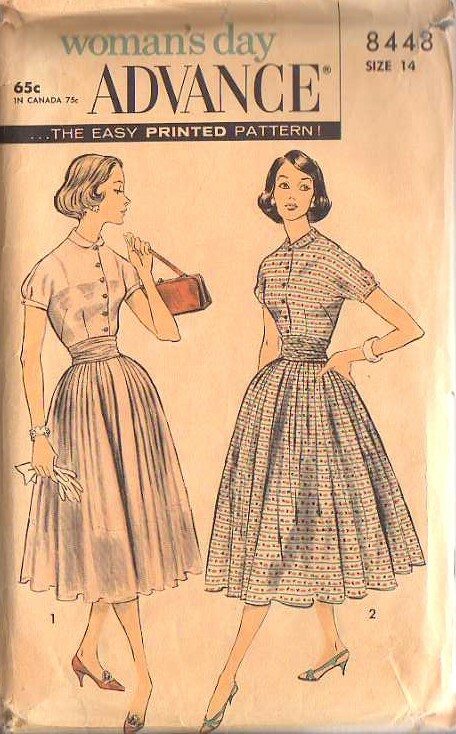 I am attempting to track down shirtwaist patterns (or at least the ones you havent yet collected!) in order to build a wardrobe of them. I do believe that I could basically live in them (besides work… silly uniforms). So I’ve got one pattern on the way, and a bunch of fun fabric.Thanks for the inspiration! Judith in Umbria, my recollection is that EvaDress actually DOES have a couple of Ma Kettle dresses – even in biggish sizes. Look for 30s housedress patterns, and if you’re of a somewhat cylindrical build, consider certain of the 20s patterns as well. After all, Ma Kettle certainly appeared in a number of movies, and her real world contemporaries were stitching their fingers off in order to have something to wear. Vintage is not only for the young, nor limited to the thin and/or flatchested!Now going to see if I can find a copy of “The Garden of Allah”!